For Christmas this year, I bought my daughter quite a few new board games. There are so many exciting and interesting ones out there, I knew it would turn into a fun adventure for us. Plus, she's seven, so just the right age for many of these games and a great way to see if they will work for third graders. While playing, I realized that so many of these would be a great addition to a classroom! We have a few of the more familiar games like Trouble, Mancala, and Rush Hour for Friday Free Choice, but why not add some new ones to the collection? 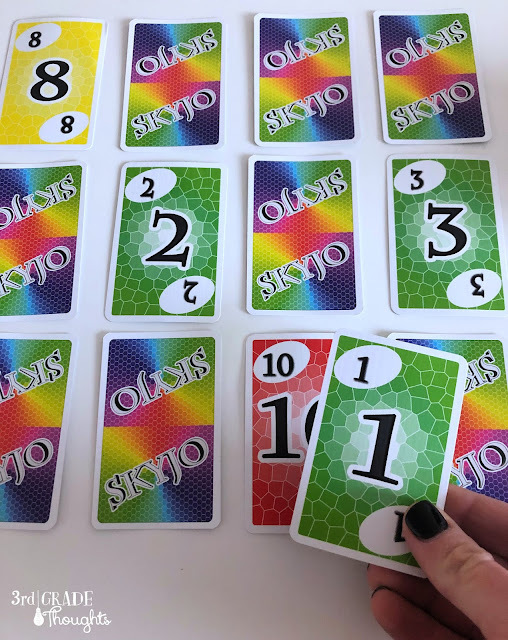 The first game I'm sharing with you, Skyjo, is a fantastic game for Free Choice or math. It requires mental math in both positive and negative numbers (down to -2), decision-making, strategy, and also some luck. I played this with my boyfriend and my daughter and it was fun with two or three people. You could easily learn in groups of two, then extend it to larger groups when everyone is familiar with the game. Up to eight can play the game. The goal of this game is like golf: the lowest score wins. 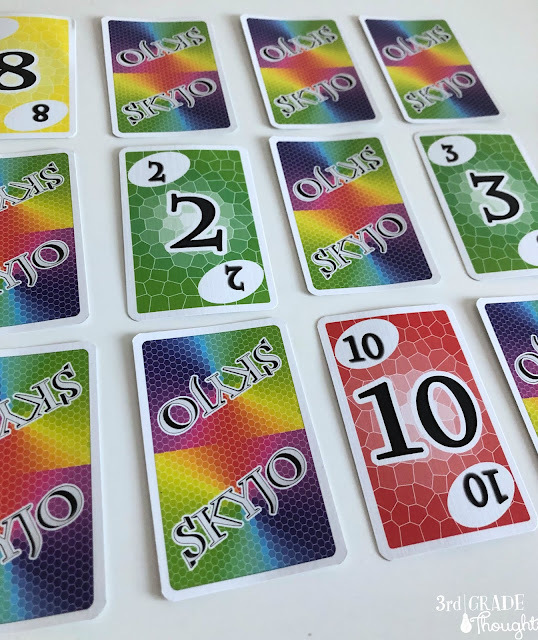 In order to win, one player will need to get a score that is 100, so it takes several rounds of play. Of course, you could adjust this depending on the time you have available in your classroom. One round is sufficient for both math practice and fun! 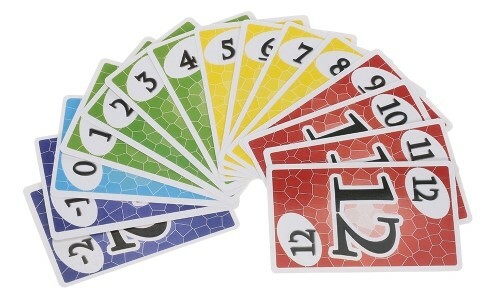 Every player gets twelve cards, face down, that they will arrange into three rows of four. Because of this, the deck is *huge* and will require several shufflers to get it sufficiently mixed up. Each player begins by flipping over two cards. No one can see their cards prior to the game, so that's where the luck of the deal comes into play. Whoever has the lowest total of the two cards begins. Cards have numbers on them, no symbols, that range from -2 to 12, including 0. The cards are color-coded, which I find to be a fantastic aide! Larger numbers are in red, middle in yellow, low in green, zero in blue, and negative in purple. It really helps to visualize what cards you need to get rid of (red) and those you want to keep (purple). Take a card from the draw pile. Take the top card from the discard pile. Replace a card that is face-up and put that card on the discard pile. This is perfect for replacing a larger-value card with a lower-valued one. There is no better feeling than replacing a 12 with a -2 and sending the 12 to the discard pile! Discard the card you drew, but that requires you to flip over any card. Replace a face-down card with the card you drew. This is tricky since no one knows what the face-down cards hold. You may end up switching a 2 for a -2, but because that was your choice, you have to discard the -2. Because of that, we try not to use this option, if we can help it. The play goes around and around until one person has flipped over all of their cards. Once that person flips over their last card, everyone else has one more turn. Then, the game is done and the addition begins. Any cards that were not flipped over are flipped over now and are included in the person's score. It's never fun finding a 12 at this point in the game! Players add up their points and get a total. The person who flipped over all of their cards first needs to have the lowest score. If they don't, or if it's tied, they have to double their score and that's the worst, believe me! There are also some special scoring rules to make the game even more complex, but we're not there yet! If you are continuing to play until someone reaches 100, you'll start a new round and add totals together until that time. 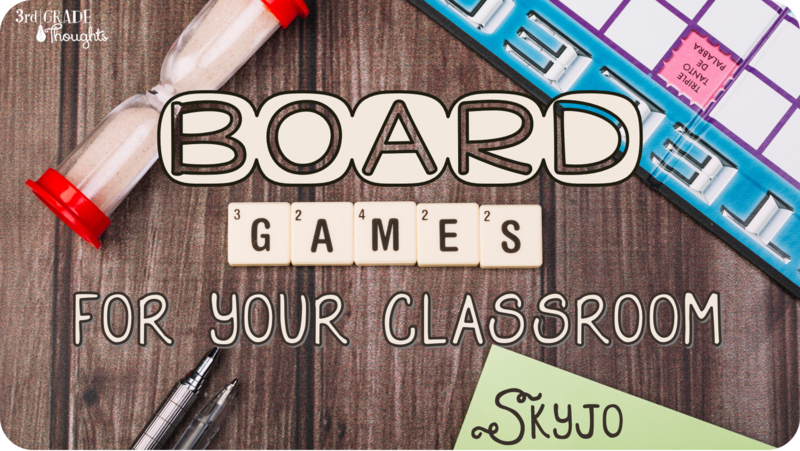 In a classroom setting, that can be a long time, especially at the beginning when everyone is just figuring out the game, their strategy, and all of the addition. I would recommend just one round with the limited time we have. 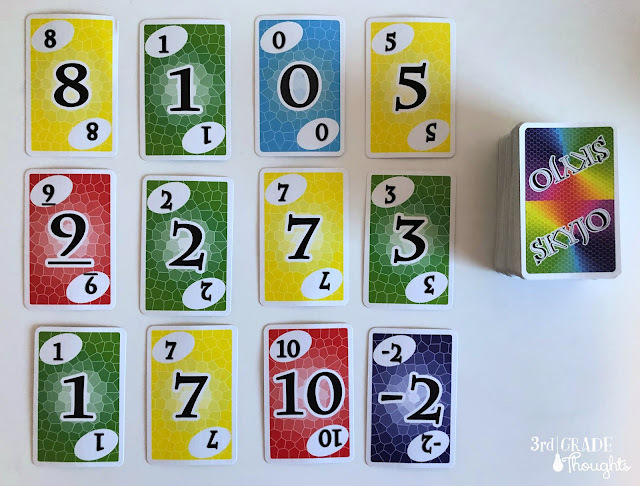 Because each player has an array of twelve cards, it does require some room, but this game could easily be played on the floor if your tables aren't sufficient. 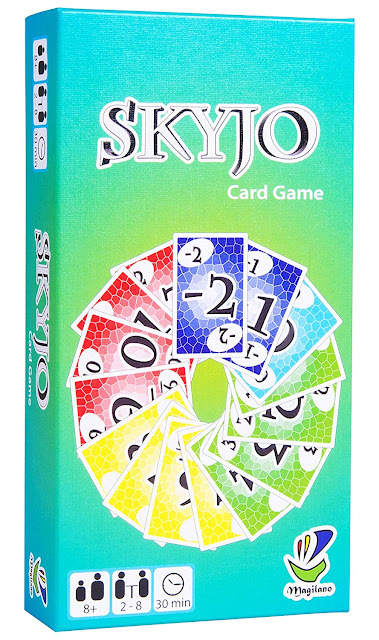 Skyjo would be a perfect centers game, Friday Free Choice game, or extension activity. The excitement is high when someone draws a -2 and everyone understands the frustration of drawing a 12. For such a simple, card-only game, it's delightfully complex and high-energy. Find Skyjo on Amazon HERE and I'll be back with more recommendations soon!